Jesus is Alive He has Risen from the dead and He is Alive! The Oil Painting is by J.M.R. 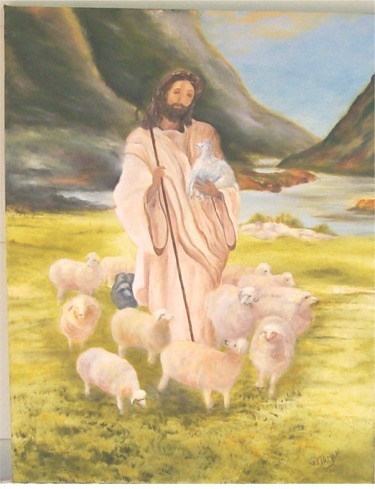 Larman and depicts Jesus as our Shepherd. We are the Sheep of his pasture and He loves us and cares for us. Have you ever asked The Lord to examine your heart and mind? It makes you wonder when He examines us what will He find? I think it best to try to have a look into our own hearts before we ever ask The Lord to take a look. Our minds are sometimes a minefield, full of things that they should not be full of. We best get rid of some of the awful things that seem to come into our hearts and minds before we ask God to examine them. Maybe best to start straight away! Let me see have I let go of worry, anger? Oh dear seems a lot of rubbish in there that should not be there, how about you? The above is taken from the book: ‘Drink from the Cup’ by J.M.R.Larman. God made everyone according to a pattern. Malachi: Chapter 4 verse 4. I gave Him at Horeb for all Israel. Do you remember the law that was given to Moses, we know that as Christians we live by grace now and not by law. However we do need to live according to the Commandments that were given to Moses. If we break one we may as well have broken the lot because in the eyes of God – sin is sin however large or small. I am thankful that we can ask Jesus to forgive us and that He does, especially as we go before God asking for all that we seem to ask Him for! Taken from the book: ‘Drink from the Cup’ by J.M.R.Larman. I have put a picture of a Scroll on here today to remind us that the Ten Commandments may have been put on a Scroll to be read out to people. We are very fortunate that we can read them in our Holy Bible (Exodus 31:18) it is good to check them out once in a while to see what we should be doing and possibly not what we are doing. So what other Gods do we have in our lives…. maybe some sort of Idols, or maybe the love of money, food, gossip, television, there are lots of things that take priority in our lives instead of living a godly life with the love of Jesus and walking with the Holy Spirit in our daily lives. One thing is to love our neighbour as ourselves (difficult that one – if we are not keen about talking to some people) even family members. It really is a Christian challenge to try to keep the Ten Commandments isn’t it? Let us Pray that we can become more Godly day by Day walking in the Love of The Lord.